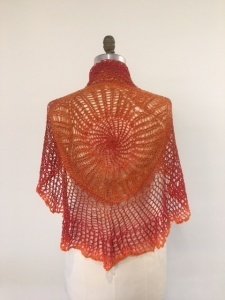 So by now, you should have the concept that you can use short rows to modify the shape of the basic circular shawl into anything you might like. Here are some examples of shaping variations. 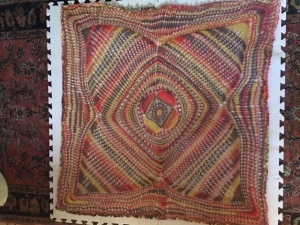 A square shawl on the blocking board. The yarn is from Lane Cervinia (Italy) “Forever” 75% superwash wool, 25% nylon, color “Partite Pertie”. 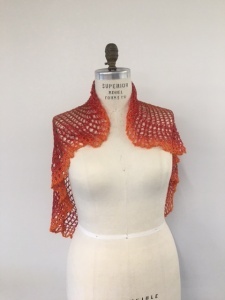 The yarn comes in 50 gram balls (210 m) and I used just under three balls to make this 48″ square shawl. Note that there are multiple uses of short rows in this piece. 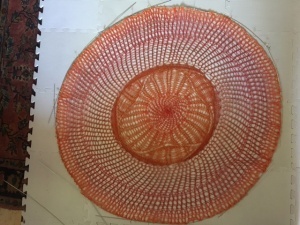 The initial short rows, in the center, were done after only 128 stitches of the basic circle. Then the piece was worked out for several inches before again dividing the work into four parts and working short rows over the larger number of stitches, incorporating the lace pattern into these short rows. Because short rows worked over a decreasing number of stitches produce something more leaf-shaped than strictly triangular, in this piece I also worked some short rows in the area between the large short row sections to straighten the edge of t he piece before finishing off with simple border in the lace pattern, and the usual ruffled finish. 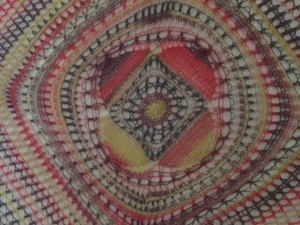 A detail shot of the central motif of the piece, showing the initial short rows and the start of the second set of larger short rows. 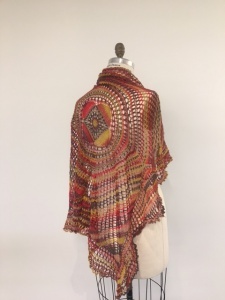 This is a good time to talk briefly about another design feature of these shawls. The circular pattern relies on stitch increases which double the number of stitches in a single row. You can make stitch increases, for example, by knitting into the front and then the back of each existing stitch. This would make a rather dense looking pattern, so I almost always make my increases by doing the yarn-over-knit-one method described in the basic pattern. 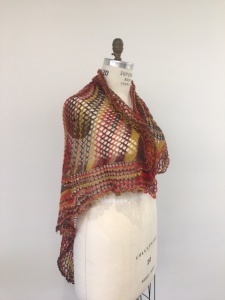 Since I am looking for a very open looking, lacey pattern look to the shawls, I use the increases as part of the open-ness. But you may like to play around a bit as you experiment with modifying these patterns. 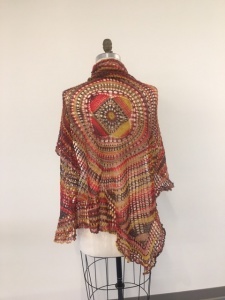 This is, admittedly, a circular shawl (48″), but I show it because the central motif is actually triangular/hexagonal in shape, before returning to the basic circular shape, with spiral. It was worked pretty much the same as the triangular pieces described above, and then additional short rows worked over the center of the joins of the first triangles. The thought was to make a six-sided floral looking central portion of a circular scarf. Once the six points were worked, they were surrounded by knitted rows with short rows filling in between the points to resume a circular pattern. Yarn is Cascade Yarns, “Heritage Wave”, which is 75% superwash wool, 25% Nylon. It is a tightly spun 4-ply yarn (on ply is the nylon) and a joy to work with. 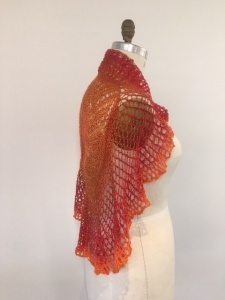 It comes in 100 g hanks (437 yds/400m) and one hank did the shawl shown. Next we will start to have some real fun with the techniques discussed so far.